Jesus said to them, “Go into all the world and preach the good news to all creation” (Mark 16:15). The Greek word for “creation” is cosmos. The Gospel (good news) is for all creation. Believers are called to be ambassadors, witnesses, first fruits of this good news. Creation is to benefit. Creation is to be blessed. The extraordinary good news an angel announced to shepherds on Bethlehem hillsides 2000 years ago was, “Do not be afraid, for I bring you good news of great joy that will be for all the people. 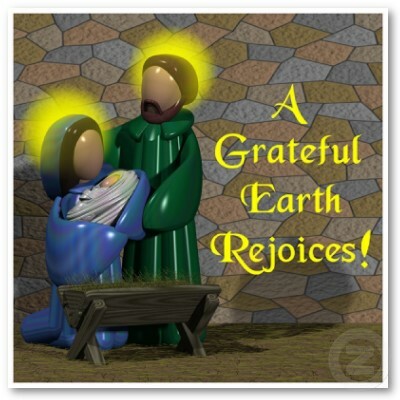 Today in the town of David the Savior has been born to you, he is Christ the Lord” (Luke 2:10,11). Verse 4 (Jesus is the measure and marker of how we humans and our nations are to rule. Alas! How far short humans fall. Let us enter 2010 with renewed commitment that our deeds and lives will indeed be witnesses and advocates of Jesus’ Good News of Great Joy to our neighbors, to our communities, even to our enemies, and to all creation. Bethlehem, where Jesus was born, lies in the Judean hill country, part of a broad-shouldered north-south mountain spine lying between the Mediterranean Sea to the west and the sub-sea level Dead Sea to the east. The inhabitants were adapted to this rugged hill terrain. Jesus later on grew up further north on that mountain range, in Nazareth in the province of Galilee. The aristocratic priests and elite urbanites of Jesus’ day looked down their noses at Galileans. For one thing, Galileans had an accent that included a slurring of their words to such an extent that words were often misunderstood. The Temple priests accused Galileans of being lax in their tithes and religious observances. The priests did not believe Galileans had good character or intelligence. Since Galileans were poor agricultural people, and in disfavor by the urbanites, they came to be derisively catcalled, am ha-retz, “people of the land.” Or in modern vernacular, “hillbillies.” Jesus was a hillbilly. Shepherds in the time of Jesus were looked down upon as unreliable, uncouth, thieving, and rowdy. Their testimony was not allowed in court. Yet it was to shepherds that the angel announced the birth of the Savior. Modern elites today tend to look down on mountain people living in the heart of Appalachia in a way that is analogous to Galileans and shepherds of Jesus’ time. And it seems easier on the conscience to defraud and exploit mountain people once they’ve been downgraded. A desecration such as mountaintop removal would never happen in the Poconos or Catskills that are playgrounds for the rich and mighty. A few months before Jesus’ birth, Mary his mother prophesied about this birth.” He has shown might in his arm: he has scattered the proud in the conceit of their heart. He has brought down the powerful from their seats, and has exalted the humble. He has filled the hungry with good things; and the rich he has sent empty away” (Luke 1:51-53). Jesus’ identification with the lowly of the world, those looked down upon by the self-sufficient and proud, is not part of today’s slick and tidy Christmas story. Yet this is a vital part of the Christmas message. So…go tell it on the mountain!